Log on to MXGP-TV.com this weekend and watch the Monster Energy FIM Motocross of Nations 3 days, this Friday, Saturday, and Sunday! The 2018 Monster Energy FIM Motocross of Nations at RedBud this weekend will host the biggest names in motocross from around the world! The biggest race of the year will also be the most attended and most watched race in recent history. From the home team USA with Monster Energy Kawasaki’s Eli Tomac, Yamalube/Star Racing Yamaha’s Aaron Plessinger, and Monster Energy Yamaha Factory Racing’s Justin Barcia to the reigning French champions of Rockstar Energy Husqvarna Factory Racing’s Gautier Paulin, Yamalube/Star Racing Yamaha’s Dylan Ferrandis, and VHR KTM’s Jordi Tixier the competition will be epic. Not to mention the Dutch riders, Red Bull KTM Factory Racing’s Jeffrey Herlings, Team HRC’s Calvin Vlaanderen, and Red Bull KTM’s Glenn Coldenhoff or the charismatic team Puerto Rico with Travis Pastrana, Ryan Sipes, and Kevin Windham! 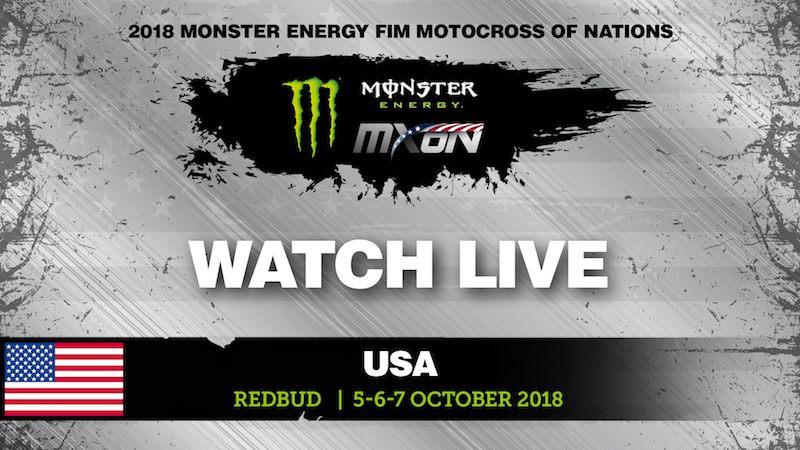 The live coverage will not only include the Qualifying races LIVE on Saturday and all of the final Motocross of Nations races LIVE on Sunday but also the LIVE Teams Presentation on Friday evening where each team will be introduced to the crowd onsite. In addition the MXGP-TV Studio Show will be hosted by Paul Malin and special host Jeff Emig on Saturday afternoon with Ken Roczen, Gautier Paulin, Justin Barcia, and Travis Pastrana!